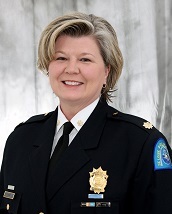 Major Angela Coonce joined the Metropolitan Police Department as a Police Officer on March 2, 1998. After graduating the Academy, she was assigned to the Fifth District. As an officer she also served in the Intelligence Division. While assigned to the Intelligence Division she was promoted to Sergeant on April 1, 2006. While in the rank of Sergeant, she served in the Intelligence Division, Ninth District and Office of the Chief of Police. On October 15, 2008, she was promoted to Lieutenant and was transferred to Fourth District. While in the position of Lieutenant, she served in the Laboratory/Identification Division and Intelligence Unit. She was promoted to Captain on October 6, 2014 serving as the Commander of the Intelligence Division and Second District. On April 12, 2018, she was promoted to Major and was assigned to Technological Solutions and Investigations Unit where she is presently assigned. She is a graduate of the 236th Session of the FBI National Academy and Session 61 of the Police Executive Research Forum’s (PERF) Senior Management Institute for Police (SMIP). She attended the Anti-Defamation League’s – Advanced Training School on Extremist & Terrorist Threats, the Southern Police Institute’s Chief Executive Leadership program, the United States Secret Service Dignitary Protection Seminar in Washington D.C.
Major Coonce has a Bachelor of Science degree in Urban Studies from Harris-Stowe State University. She has a Master of Arts degree in Management and Leadership from Webster University. She also has a Master of Arts degree in Security Studies from the Naval Postgraduate School/Center for Homeland Defense and Security in Monterey, California. Major Coonce has been recognized with the following awards; Best Overall Recruit – Academy Class 98-1, Defensive Tactics Award – Academy Class 98-1, High Academics – Academy Class 98-1, 2 Officer of the Month Awards, 1 Award of Excellence Award and 6 Chief Letters of Commendation.